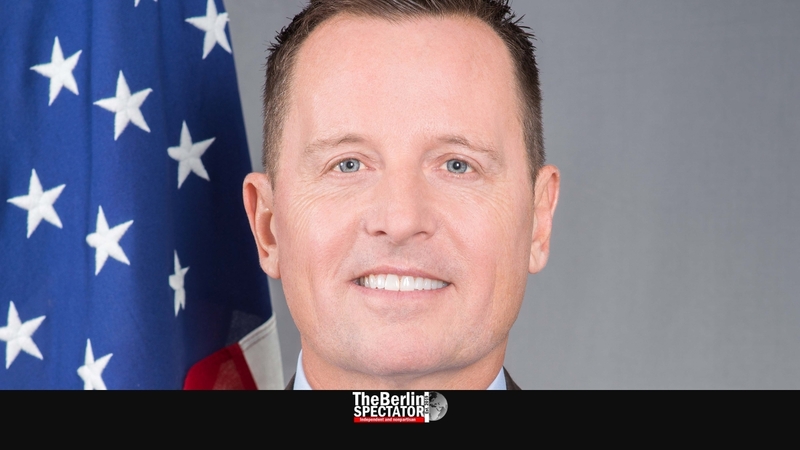 The Ambassador of the United States of America to Germany, Richard Grenell, has harshly criticized the United Nations Human Rights Council (UNHRC) today, for singling out Israel and for passing far more resolutions against the predominantly Jewish state than against all other countries combined. At a rally organized by the NGO ‘U.N. Watch’ in Geneva, Ambassador Grenell said the UNHRC was discussing “a set of phony allegations” against Israel, yet again. Grenell told the participants of the protest: “I think it speaks to the integrity of the Human Rights Council that we already know what the decision will be before they even vote.” By saying so, Grenell was referring to the voting history of the U.N. body. For that reason, the United State have left the so-called Human Rights Council in the summer of 2018, while Germany and other European countries still refuse to do so. Ambassador Grenell directly accused the UNHRC of antisemitism. 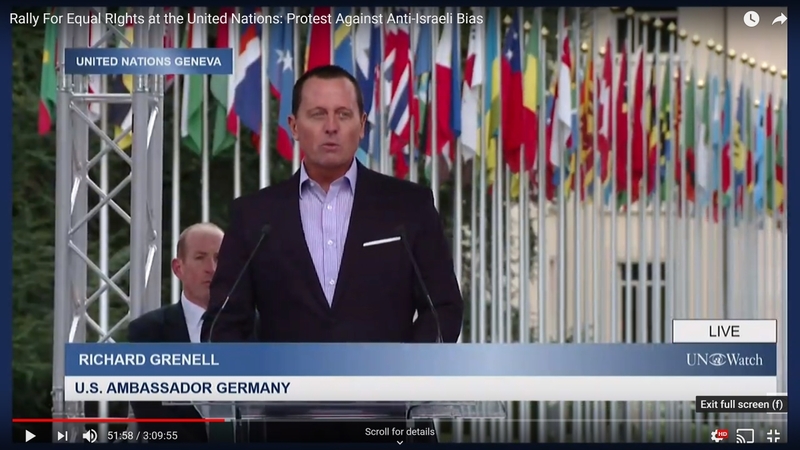 “An institution whose entire world view is dominated by the fear and fantasy of Jewish criminality has lost the ability to be rational, to understand cause and effect and to make positive change”, Grenell said at the Geneva protest. “Applying one standard to Israel and not applying the same to other countries is antisemitic”, Grenell said. Apart from Ambassador Grenell, many other speakers blasted the UNHRC’s treatment of Israel in front of the U.N.’s Geneva headquarters. They included Dore Gold, the President of the Jerusalem Center of Public Affairs, the French author and former ‘Charlie Hebdo’ editor Philippe Val and Knesset member Einat Wilf. Colonel Richard Kemp was there as well, along with MEP Peter Niedermüller, Czech MP Jan Bartošek, and Joël Herzog, President of the Association Suisse Israël in Geneva, plus many other speakers. ‘UN Watch’s founder Hillel Neuer (read separate article Hillel Neuer: The Advocate of Truth at the U.N.), who was also the organizer of today’s Geneva protest, collected 12,000 signatures under a petition which demands equal rights for Israel and an end to the discrimination against the Jewish state. The petition was handed over to the UNHRC today. In some European countries, the U.N.’s bias against Israel is a subject of debate. Only a few days ago, the German party FDP came forward with a motion at the Bundestag, which asked the Berlin government to refrain from voting against Israel in biased U.N. resolutions brought forward by a group of Arab states. The motion was rejected with the votes of the coalition parties.